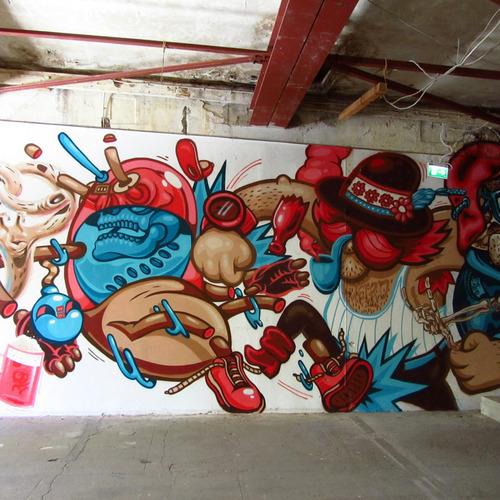 Based in Dusseldorf, DXTR is a member of the German-Austrian crew The Weird, a talented international street art / graffiti group known for their warped and imaginative characters. 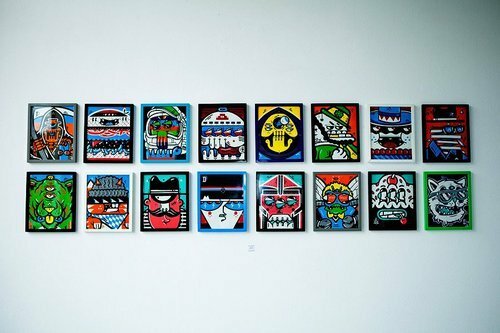 Members of The Weird don’t seem to distinguish between large walls and smaller illustrations; their imagination runs wild in any available space. We talk to DXTR about his art and the art of not getting arrested. My flat always looked like a laboratory, paint kettles and cans everywhere. So some friends called it Dexter‘s Laboratory, thats where the name comes from. I have been drawing since my childhood. In 1999, at the age of 16 I got into illegal graffiti, introduced by some friends of mine - classical stuff. I really liked painting at night, but I also always focused on sketches and character based things since the beginning. Hanging out at my friends house and sketching in blackbooks was my daily routine. University of Applied Science. I finished my diploma in 2010. 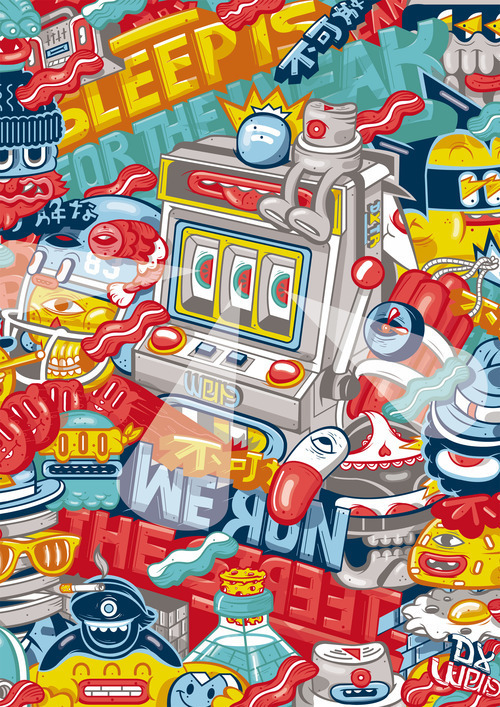 I’m still living and working here as a freelance illustrator alongside The Weird’s mural projects. Dusseldorf is a nice place and I have met a lot of really good friends here, but I have almost nothing to do with the scene here. Because I’m travelling to paint a lot, I need to spend most of my time in the studio when I come back home. It seems likely that I’ll move to Berlin since most of my crewmates now live there. I’ve painted in countries like Albania, Lithuania, the Czech Republic, Poland, Netherlands, Switzerland, Austria, Portugal, Russia, England, Luxembourg, Spain and in a lot of cities all over Germany. Tirana, the capitol of Albania was pretty crazy. There is almost no graffiti anywhere and after a day of painting in the streets everyone wanted us to paint their houses and gave us something to eat or drink. We felt very welcome over there. It was a really crazy and new experience regarding the police/authorities and the acceptance of graffiti compared to Germany. I really like to travel, meet new people and see new places. Painting gives me the opportunity to see these kind of places I would have never seen perhaps. I mostly try to be positive with my art and make people smile and think. There’s a lot of myth, irony and provocation included but the most important ingredient is the fun that I’m having while I’m doing it. I create scenarios influenced by hip-hop in the 80s and 90s, Robert Crumb, Ren and Stimpy and Fritz the Cat. A few of The Weird members have been good friends for years. 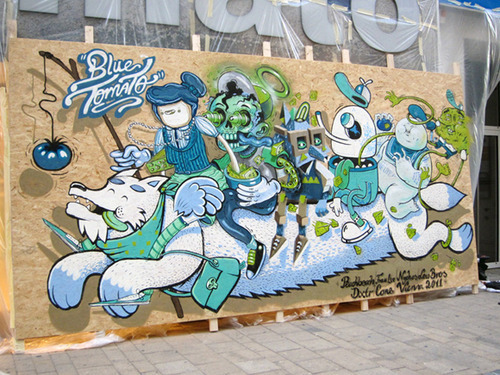 In the summer of 2011 most of us met in Vienna to paint at a festival and we stayed at Nychos‘ place. It was a very weird week and it just felt right. A few months later I had the chance to bring all of them over to the Ruhr Area here in Germany for another festival - The Weird was born! 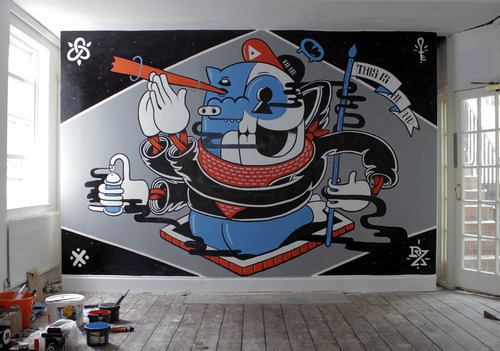 The Weird is a family of 10 “urban Illustrators / pop surrealists” located all around Germany and Austria. The members are: Cone (Saarbruecken/Munich), Rookie (Munster), Low Bros (QBRK and Nerd in Hamburg and Berlin), Herr von Bias (Berlin), Peachbeach (Look and Vidam in Berlin), Frau Isa and Nychos (both Vienna) and me. There’s a lot of stuff coming up with The Weird. The fact that we all work together more and more often has a huge impact on all of us. Let‘s see where this is going: I predict fun times. I hope to have the chance to travel more in the future. Thanks to all for the massive support in this first year of the Weirdos! Stay tuned! 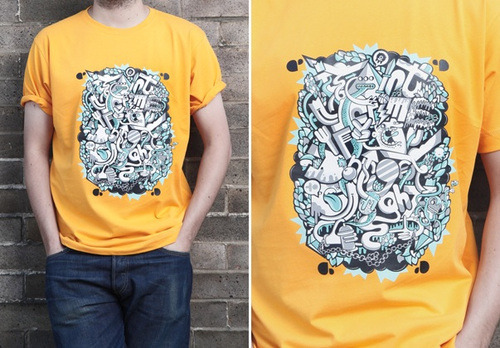 There are a limited number of DXTR tshirts available in the Global Street Art shop, produced by the awesome t-shirt co. Dirty Face. Its the end of the season so there are roughly five in each size!